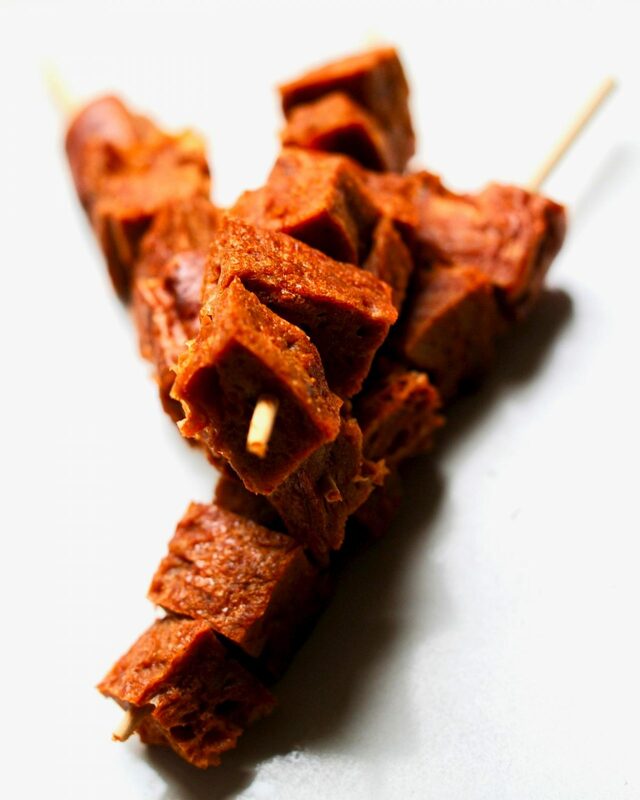 Flavorsome cubes of seitan, marinated in a rosemary-garlic sauce and charred in the broiler or over a grill. Dip these herbaceous kebabs into my cooling cucumber tzadziki for a short trip to the greek isles. Serve as an appetizer or as part of a main course. There were years that I couldn’t listen to Leonard Cohen’s songs without crying. Years. His voice brought me back to the shatteringly bright days, the carefree days, the lemon scented days, the lazy golden days of childhood and my mother’s youth on Hydra where all was possible for her and us. I still ache when his voice comes on the radio. And now this anthology has come out with all the voices singing in harmony and dissonance a song of the early years on Hydra. 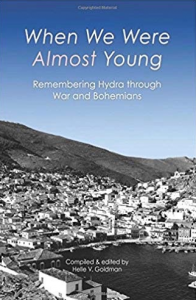 Perhaps you know of Hydra through Leonard Cohen’s songs, or as the place where the artist Ghika lived, or through Charmain Clift or Henry MIller’s writing. For me, for so many of us, the rocky, pine scented, car-less island is an old friend. My mother referred to Hydra as a lover, at times a cheating lover, a lover who snared your heart with sharp hooks. There is no shaking Hydra off. Take these Vegan Seitan Souvlaki, (Greek Kebabs) with Cucumber Garlic Tzatziki Sauce and make your very own Greek Vegan Seitan Gyros. 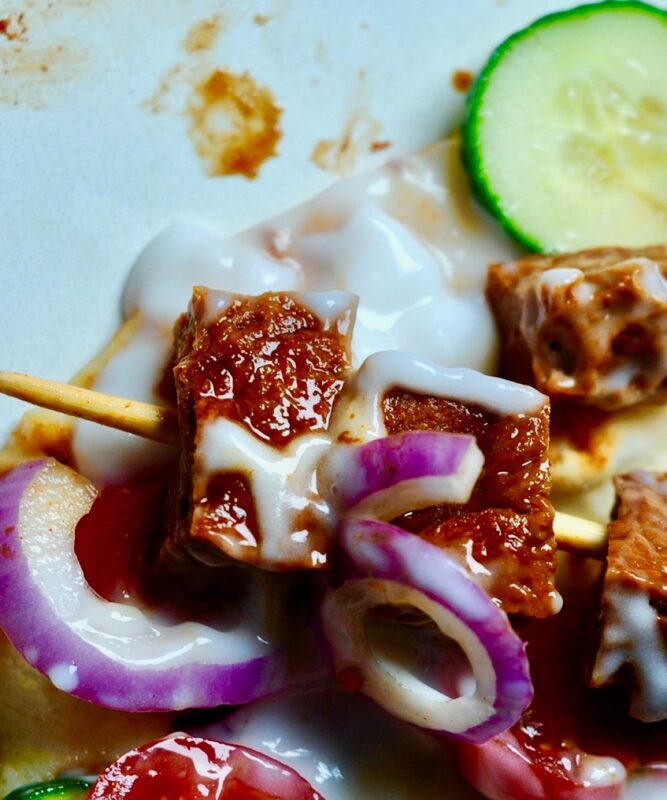 If you are a sucker for food on a stick then take a look at my Seitan Satay. 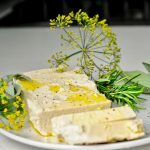 Or if it is greek food you love then you’ll love my almond based, herb marinate Vegan Feta recipe. A perfect appetizer that can be dressed up or down. Feel free to grill these in summer or broil then in the oven in winter. Served with a refreshing garlic cucumber yogurt sauce. 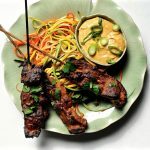 You will need 6-8 bamboo skewers or thin chop sticks for this recipe. Soak them in water for 30 minutes before you make and grill your kebabs. 1/4 cup red or white wine, they will give different but equally delicious results. Mix all of the marinade ingredients together. Cook over medium heat in a small sauce pan for 8 minutes. If making home made seitan allow it to cool and cut it into one inch strips and the into cubes. if using store bought cut into 1" chunks. 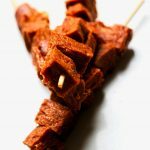 Place you seitan (store bought or home made) into the marinade and allow to sit at least 20 minutes. Stick your seitan onto soaked bamboo skewers thin chop sticks. I used six or seven chunks per kebab. Feel free to alternate veggies into your kebabs like red pepper or zucchini for a more colorful effect. Heat your oven to broil. Or fire up your grill. Meanwhile make your tzatziki. Pat your diced cucumber dry with a towel. Add all of the ingredients to a bowl, stir and set aside. 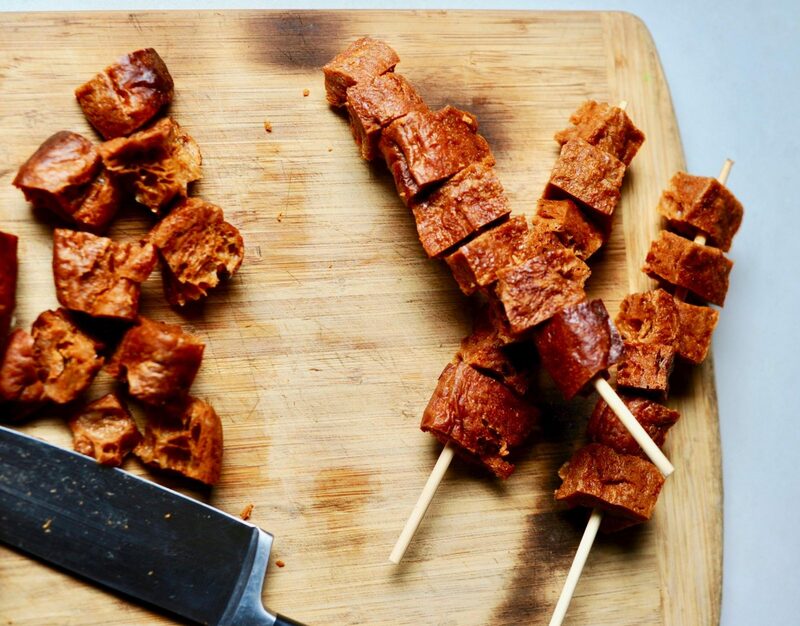 Stick your seitan cubes onto bamboo sticks or use chopsticks like I did. Broil on top rack of the oven until charred. 10 to 16 minutes, turning frequently and brushing with remaining marinade. Remove from oven, squeeze lemon over the top and serve with Tzatziki for dipping. Heat the oven to 350 degrees Fahrenheit. In a blender place chipotles, nut butter, soy sauce, liquid smoke, nutritional yeast, smoked paprika, garlic powder, onion powder and broth. Blend until smooth. In a large bowl place the vital wheat gluten, smoked paprika, garlic powder and onion powder. Stir to combine. Pour in the liquid from the blender to the dry ingredients and stir until a loose dough forms. Roll up your sleeves and knead the dough with your hands for 5-6 minutes to activate the gluten. Cut the dough into 2 pieces. Roll each into a ball and with a rolling pin flatten them into rectangles that are about3/4 of an inch tall. Lightly grease a baking pan and place the rolled out seitan pieces on it. Bake in the center of the oven for 20 minutes and remove from oven. How lucky we were to have had Hydra and our balmy parents who took us there. And how lucky we are now to have each other so we can wallow together in shared reminiscences of those days. Thank you so much for contributing to the book. Our shared sisterhood is a blessing that I am grateful for every day. Who else understands and remembers the sound of Rie fluffing out an eiderdown, or the “hey, hey, hey” as she ascended the steps. 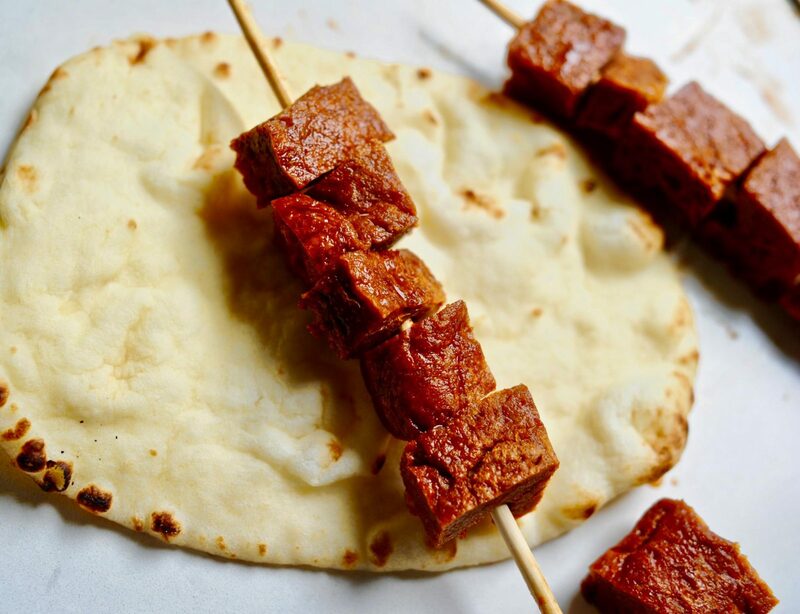 Hi there I made your vegan seitan bacon which is wonderful and i am wondering why the recipe for the seitan in this recipe is different – or what are the differences please? I’d love to try this recipe too – is the texture different because of it being baked as opposed to steaming in its own juices as in the bacon? thanks I love your recipes i am living in rainy cold Ireland and I am being transported to your wonderful island and sun, warmth and scents! Cold rainy Ireland has been my dream destination since high school. It seems so lush and drear and romantic. Yes the baking changes the texture. I wanted a dried “stringier” texture for the souvlaki. Thank you for your kind words.